A decision needs to be made – 27 Mar 2014. Before I get started I need to decide what colour to paint Rhino. Do I return it to the colour it was when it left the factory (green and black) or choose something else?A lot of people have repainted their V7Sports with red frames but I seem to be alone in not liking the look of the Telaio Rosso. So far as I can tell, there were two options available in Europe for series 1 production bikes like mine. These were the well known Lime green with a black frame and a burgundy red with a black frame. However, I could have got this wrong as I have some conflicting info. Original colour scheme. Rhino was originally like this. Lime Green and black frame. Alternative production colour scheme. Red with black frame. I also like the USA colours of burgundy red with a silver/grey frame. US spec. Red with silver frame. How important is originality? I have already decided not to go with all the chromed nuts and bolts of the original spec. The chrome soon comes off when spannered a few times so I shall use stainless where I can. I like all three colour schemes and have favoured each one over the last few weeks but now I need to make up my mind. The frame needs to go off for powdercoat soon. Current favourite is to go with the original but that could change by the end of the day. I hope I have not offended anyone by using these photos. I don’t know the sources for them as I copied them from the web years ago. Contact me if I am infringing any copyright. A little bit of history – Part 2. I tanked around the roads of Suffolk for a while but I couldn’t leave things alone. As the original paint was worn through to the grey undercoat I decided to paint the bike metalflake red – Oh the folly of youth! 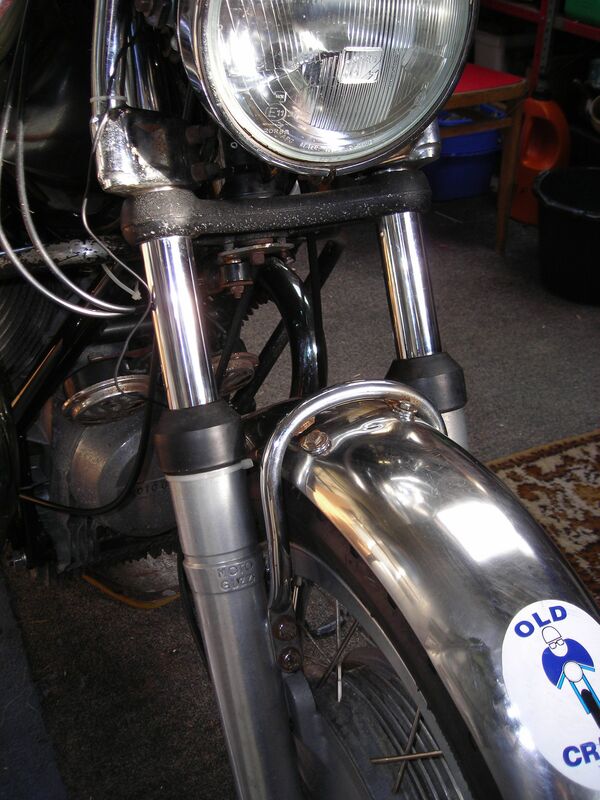 Soon after, I invested in an endurance style twin headlamp fairing from Dresda. The bike was my only transport and was well used and abused. In 1978 it was treated to a new clutch and was taken over to Europe. 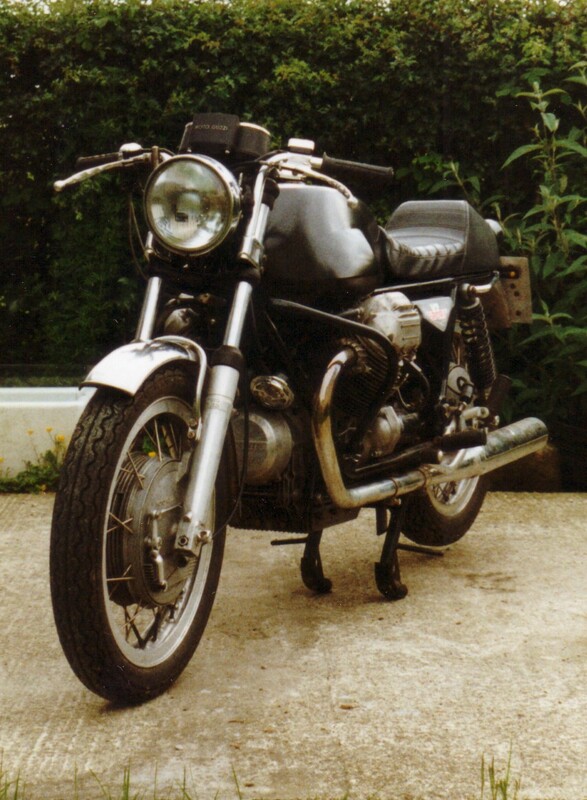 I remember roaring through sleepy French villages in the early hours of the morning with the exhaust popping and banging and flames shooting out of the “silencer” every time I shut the throttle. I had a burnt valve. I moved down to Sussex and the bike wasn’t used for a while. When I did start it disaster struck. The chrome lining had flaked off the cylinder barrels. Little pieces of hard chrome had found their way to the crank and camshaft bearings and pretty much wrecked everything. Many years later I moved again. This time to Wales. The dismantled remains were stored in a trailer at a friends place. When I came to pick them up there was half an inch of water in there. The reground crank was ruined again, this time for good. I used it as a garage doorstop for a while. Years later, in 2002, I decide that I would make a return to biking and the old rhino would be resurrected. Major engine parts for big block 750s were getting hard to come by so I bought a complete used 850 engine from a bloke in Bristol. I had some T3 pipes and found some original Silentium silencers. A few bits were rechromed and I painted the lot black as that was easiest. MOT done and back on the road. 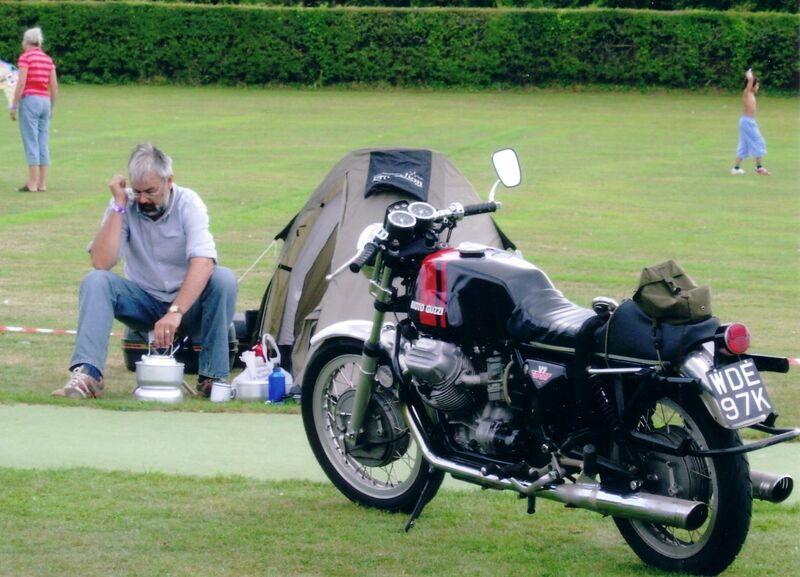 Rhino and me camping at the 2006 V-twin Rally, Fordingbridge. 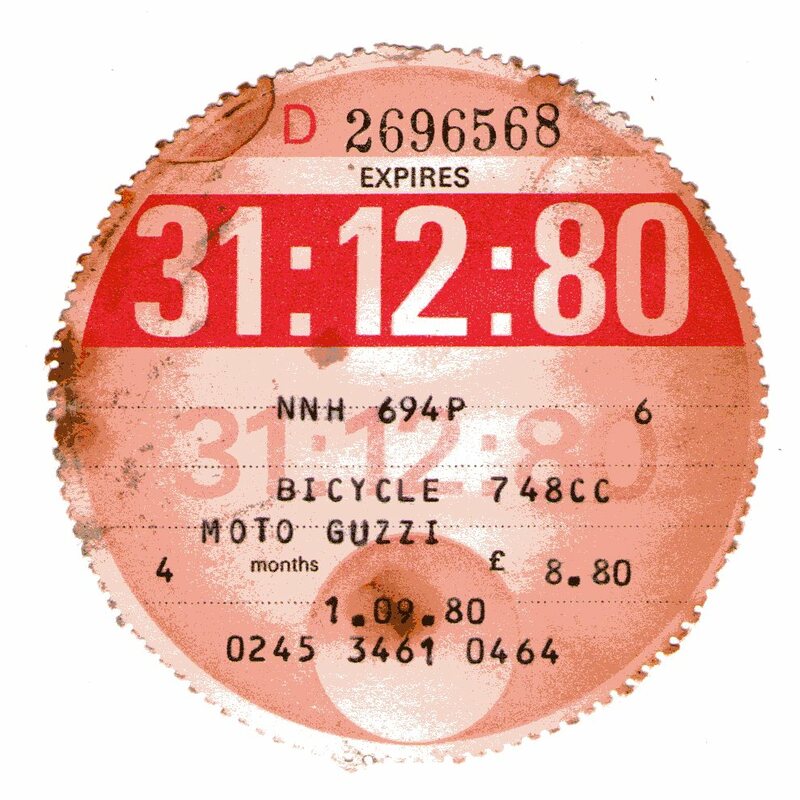 In 2006 I re-registered the bike to get a correct age related plate. I was fed up with people saying it was a copy because Sports weren’t made in ’76. It’s now WDE97K. I bought a 750S3 in bits and made a start on restoring it. The tank was borrowed for the V7Sport when it started leaking from around the filler. Nice view. I went straight on here and down the hillside! The fence is new. 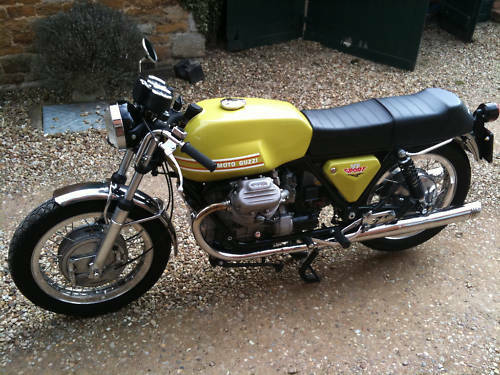 One Sunday in April 2007 I was on my way back from a Guzzi Club branch meet when I went straight on at a left hand bend. I’m still not absolutely sure what happened but I guess I was just going too fast. 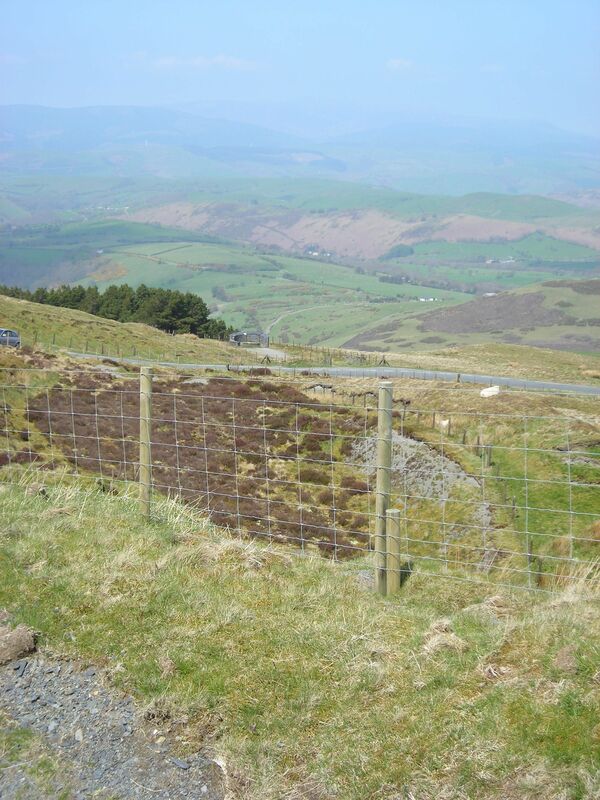 It was on a mountain road above Machynlleth. I hit the “step” at the side of the road doing about 30 and the bike somersaulted down the hillside. You could see where it landed on its tail light then front wheel and so on. I broke my arm but otherwise got away with it. The bike was badly damaged but not beyond repair. The only frame damage was to the seat support rail which sticks out from behind the top shock mount. So that’s where we are today. When I’ve finished getting the S3 ready for the riding season I’ll be making a start. 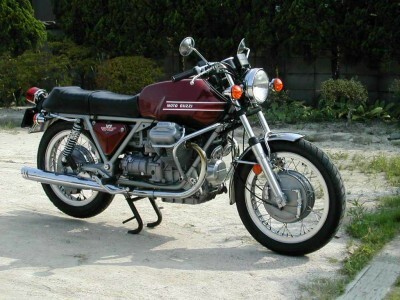 As I have said, I bought my V7Sport in 1978. This was in Ipswich where I grew up. 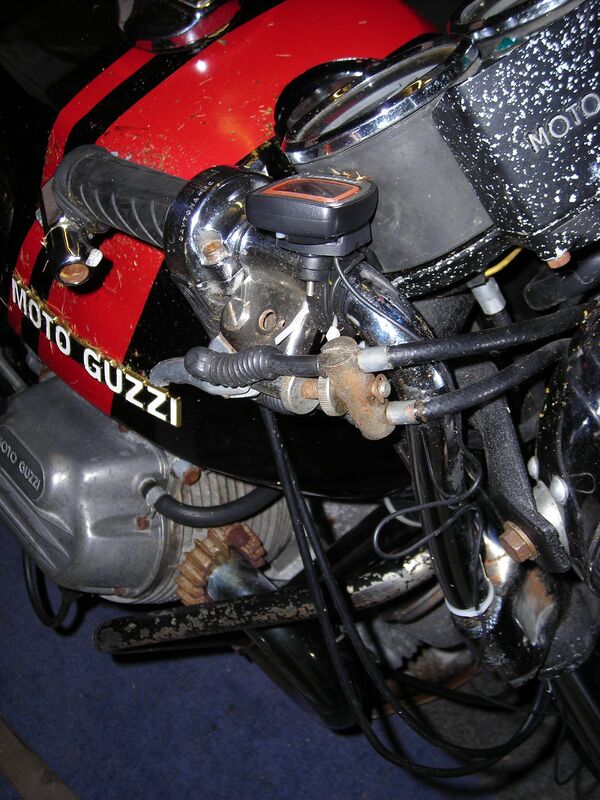 At the time, I had actually only ever seen a Moto Guzzi once before. That had been a V7Sport in Revetts bike dealers in Norwich Road and I had been very impressed. I found out what I could about Guzzis in magazines and, although they seemed very expensive, decided I would have to try one. Up till then, like most of my friends, I had been riding Japanese 2-strokes. 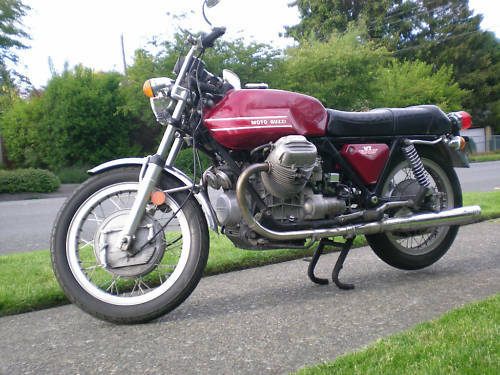 I’d had a Yamaha RD250 and owned an RD400 at the time. I saw the bike advertised in the “Evening Star”, the local paper, and it seemed like too good an opportunity to miss. I went to view the bike and the owner took me for a ride as pillion out toward Tattingstone. I shouted over his shoulder something like “how fast can it go?”, “120” he said and proceeded to prove the point. He then let me have a go on my own. So I set off leaving him at the side of the road. The bike felt very different to what I had been used to but I loved the way it went. In the end I needed to stop to turn round and nearly crashed the thing! In all the excitement I’d forgotten his warning that the brakes and gears were on the “wrong sides” and shot through an open gate! I didn’t tell the seller. I was too busy preparing myself for the pillion ride back to town. I’m not keen on riding pillion and Glenn, who was selling the bike, was very um, enthusiastic. I didn’t buy the bike that day. I told the seller that it was too much for me. I was also mindful that I had been told by my parents not to come home with any bigger bikes. However, after a couple of days I had borrowed the necessary funds from the bank and went back to see the bike again and buy it. The owner said “I knew you’d be back” as I handed him the £750. There was trouble when I got home! Sadly, I don’t have any photos of the bike as it was then. I’m not sure I even owned a camera. The bike was the lime green colour most sports were and had a black frame. It had the later style seat as fitted to the 750S and S3 models plus a very noisy two-into-one exhaust system. Although it had crash bars fitted there were signs on the rocker covers that it had been dropped. It had been UK registered in March 1976 as NNH694P (it no longer wears that number) and it seems that Glenn, who I got it from, bought it 2 days later. 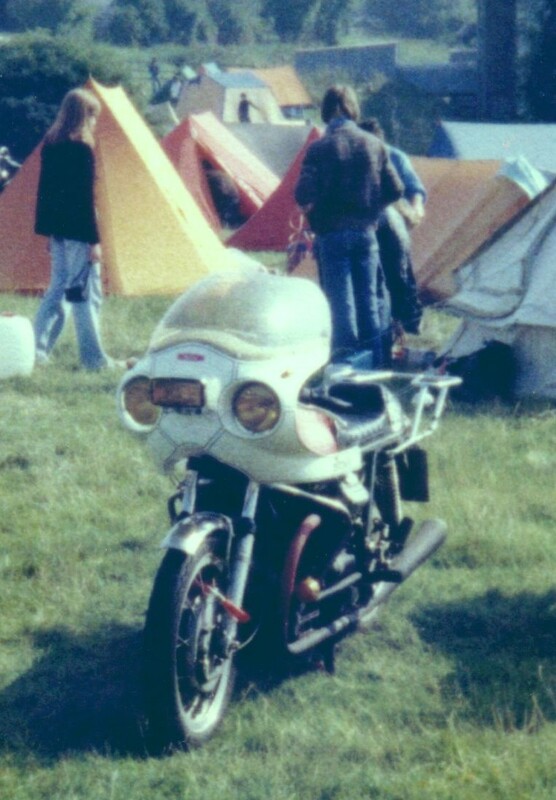 I have the import documents which show the bike as having been privately imported by someone at RAF Wattisham. 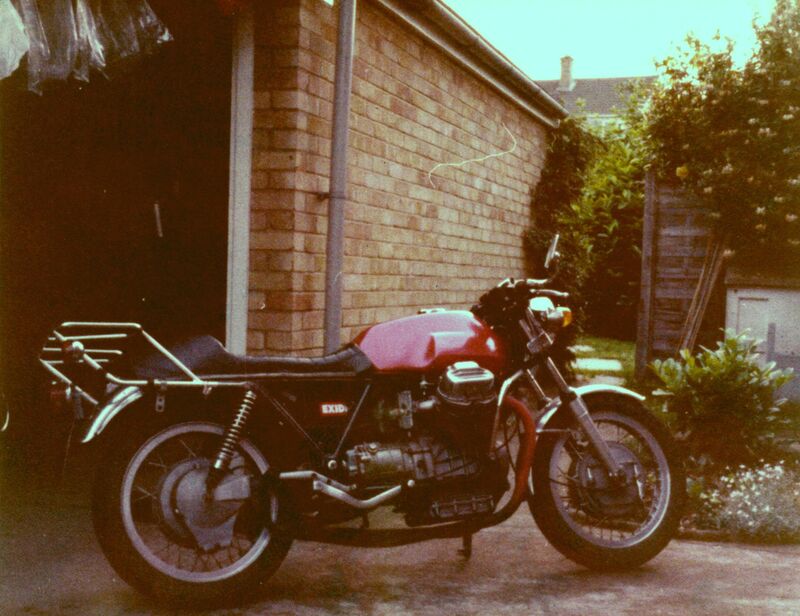 This is the earliest photo I have, probably taken in late ’78 or early ’79 and, although poor quality shows the bike missing its tool boxes after getting a coat of metalflake red paint on the tank.